Andy Leleisi’uao is a “Kamoan” (meaning Kiwi + Samoan, a term coined by the artist himself) artist who is the first New Zealander to be accepted for an inaugural three-month Taiwanese arts residency offered by the Asia New Zealand Foundation in partnership with the Taipei Artist Village. He completed the residency at the end of March this year, wrapping it up with a group exhibition and open studio event at the Taipei Artist Village. Leleisi’uao began his artistic career as a widely celebrated social commentator on Samoans living in New Zealand; his paintings controversially exploring issues associated the Samoan diaspora. As he has developed his style, he has begun to both internalize and universalize these themes, exploring fantastical worlds and opening his art to a global audience. His early art can be uncomfortable to view, often described by critics as confronting and controversial. In these works, his themes and intentions are obvious to the viewer; he shouts them from the canvas. 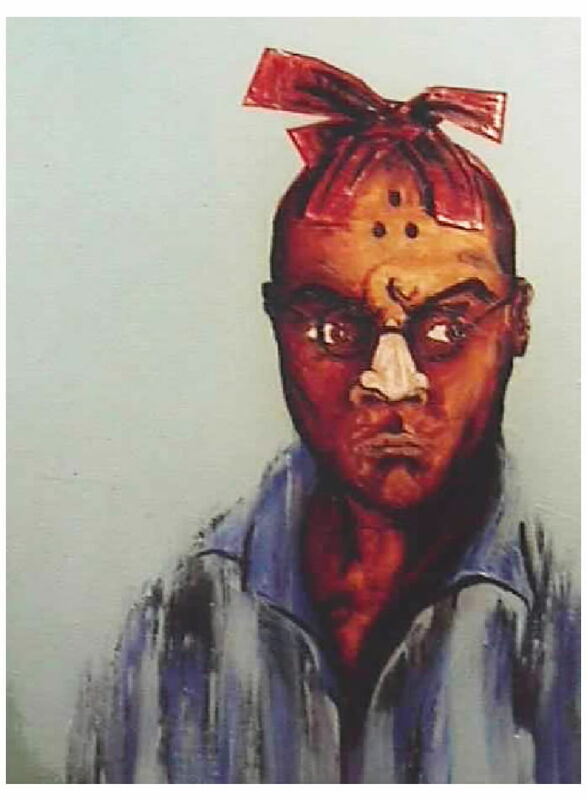 During the late 1990s, Leleisi’uao’s paintings were highly politicized, socially motivated and somewhat autobiographical. He dealt obviously with the societal problems – domestic violence, poverty, unemployment and youth suicide – faced by blue-collar Pacific Island, particularly Samoan, immigrants to New Zealand. Pacific Island communities are generally strongly Christian and Leleisi’uao often highlighted the negative impact of the church on Samoan families, painting expressionistic pastors getting richer as communities get poorer. This focus on the negative albeit real issues faced by Pacific Islanders living in New Zealand is something that at times put him at odds with local communities. Since the early 2000s, however, Leleisi’uao has moderated and universalized his voice, shifting his painting focus and style. His most recent paintings are far less direct in their presentation of the painter’s ambitions and motivations. While still dealing with issues of social dislocation, he utilizes mythology and spiritualism to conjure up alternate universes populated with fantastical creatures. 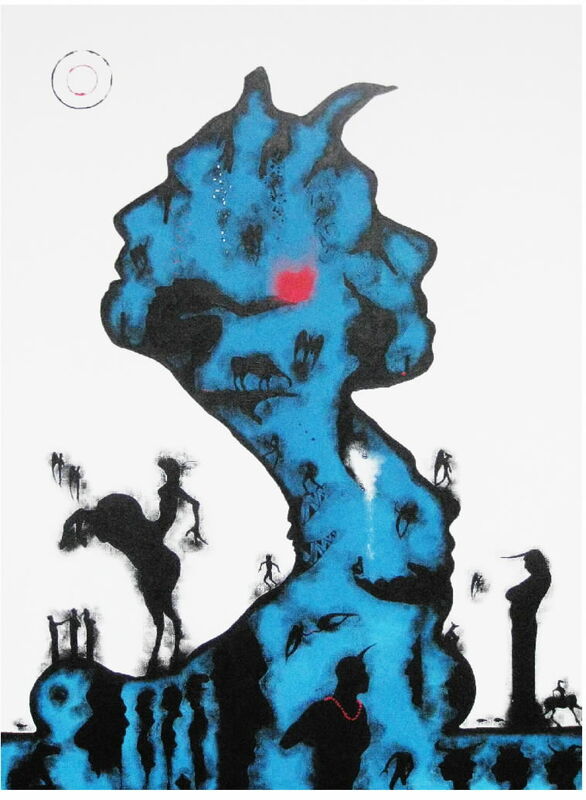 A critic described paintings in 2009 exhibition Le Onoeva – Misunderstood Aitu as “Armageddon-like, with gods and demons bringing saviour and damnation to a waiting populace,” while many others noted the recent moderation of his style. 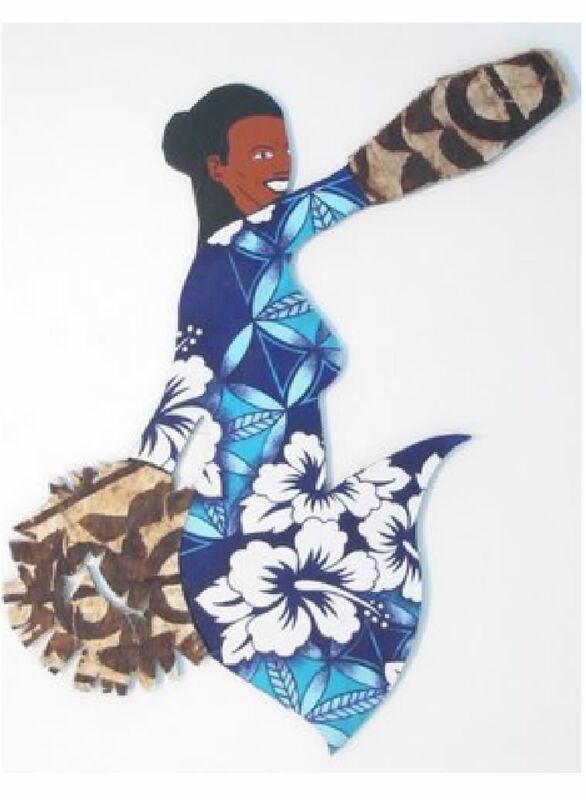 Though reportedly toned-down, Leleisi’uao’s newer representations still manage to stir public opinion; as reported in 2009 in the National Business Review, a commissioned public mural project planned for a community centre in South Auckland, New Zealand, came to a halt due to local community backlash. Andy Leleisi’uao is represented by Whitespace (Auckland, New Zealand) and BCA (Raratongo, Cook Islands). This year, he has solo exhibitions in various major cities in Auckland and group exhibitions in Taiwan and New York. He recently won the coveted 2010 McCahon Arts Residency. His works are collected by major art museums and institutions worldwide including Auckland Art Gallery, Auckland University Collection, BCA Collection, Casula Powerhouse, Chartwell Trust Collection, Frankfurt Museum, Ilam University Collection, James Wallace Trust Collection, Manukau City Collection, Pataka Museum of Arts and Cultures and Te Papa, Museum of New Zealand. 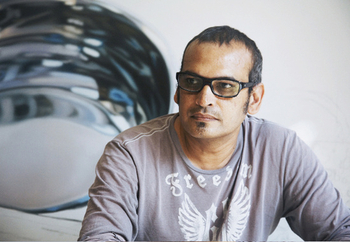 New Delhi-based contemporary artist Subodh Gupta is not backward in coming forward with his views. Smiling firmly, he chose not to respond to introductory remarks made by moderator William Pym, Managing Editor of Art Asia Pacific magazine at a talk hosted as a side-event of the Christie’s Hong Kong autumn 2009 auctions . Instead he turned to face the audience: “Let me tell you all clearly why I am here today. Originally this was supposed to be a one-on-one talk with Art Asia Pacific. I was happy about that. But then it turned into a group talk hosted by Christies. I prefer to work with curators, writers and critics rather than auction houses”. Christie’s Hugo Weihe, International Director of Asian Art who was sitting in the front row looked slightly startled. So Subodh Gupta is a man who is not afraid to say what he thinks….this talk was shaping up to be interesting. Moving attention swiftly to the art, Pym invited Gupta to discuss a series of slides of his works many of which were featured in his Hauser and Wirth solo show “Common Man” which ended October 2009. 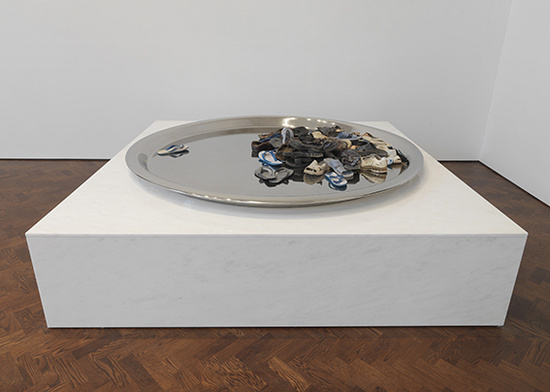 One set of works comprised three over-sized thalis (thali is a Hindi word meaning plate on which a series of small bowls of food are placed) each featuring its own grouping of like items: used sandals, kitchen utensils and coins in oil. 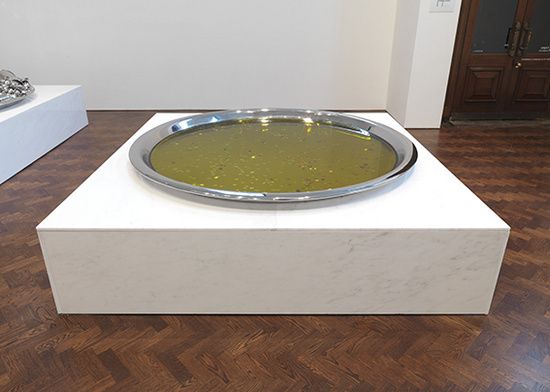 The assemblage of local and global influences is evident in Penny for Belief II in which a large thali is filled with oil and coins. He explained that his globe-trotting lifestyle led him to notice that many cultures share behaviourse for expample the belief in the value of throwing coins for blessings. Local rites have underlying universal themes. “In the United Kingdom, China and India, they throw coins into different things: oil, water and empty pots. But they all believe in throwing coins”. After leaving school, Gupta joined a small theatre group in Khagaul and worked as an actor for five years. This has informed his view of his role as an artist. “As an artist I have to adapt myself to the subject of my art. An artist is like an actor, he also has to adapt himself”. Gupta clearly relishes art-making as a participatory and flexible endeavour and he is comfortable allowing viewers of his work to join in too. He explained that he let visitors throw their own coins into his thali artwork. “Didn’t the guards at the Hauser and Wirth gallery stop people from doing that, they are usually very protective of the art” asked Pym looking surprised. “No we told the guards to let visitors throw their own coins. It is part of the art and, you know what, we had coins from all over the world”. Labourers and travel remained the focus of the conversation as it turned to slides of his renowned luggage trolley series which included one of Subodh Gupta’s sculpture of a gilded bronze luggage trolley and three pieces of aluminium luggage called Vehicle for the Seven Seas (2004). 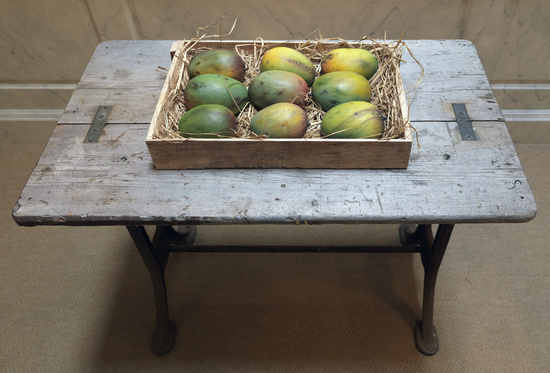 According to Artcurial, this work posted an auction record price for the Indian artist when it fetched €502,330 ($785,243), more than triple its €140,000-180,000 estimate, under the gavel on April 3 2008. He noticed that they had a particular and unique way of wrapping up their belongings for the journey. He became more and more intrigued by these packages and pieces of luggage which were so tightly and securely wrapped. ” I began to get talking to the passengers who were tailors and taxi drivers and construction labourers … I asked them what was inside. It turned out that the contents were quite ordinary, their everyday belongings plus a few clothes for their children, perhaps a little jewellery for their wives. But these parcels seemed to me to be themselves like jewellery and so I started working on them”. Wrappings as a source of inspiration and of value in their own right is a motif which recurs in his work. In his ‘Jeff the Koons’ installation, Gupta has cast in aluminum copies of the cardboard boxes that Koons’ mailorder ‘Puppy’ sculptures come in. The son of a railway guard who arrived penniless in Delhi in 1988, Gupta who produced conventional canvases for many years before making sculpture, has clearly come a long way. Now Gupta’s everyday, his immediate sphere, his source of inspiration is no longer a rural world of steel buckets and tiffin boxes. Instead his environment is one of international travel, world-class art and well-deserved prominence. Although he can be disconcertingly direct, sometimes to the point of being dismissive, it is hard not to like Subodh Gupta for his integrity, his humility and his fearlessness. Gupta may not be happy with Christie’s but the audience was thrilled by their up-close encounter with this complex engaging artist which Christie’s helped to host and promote. 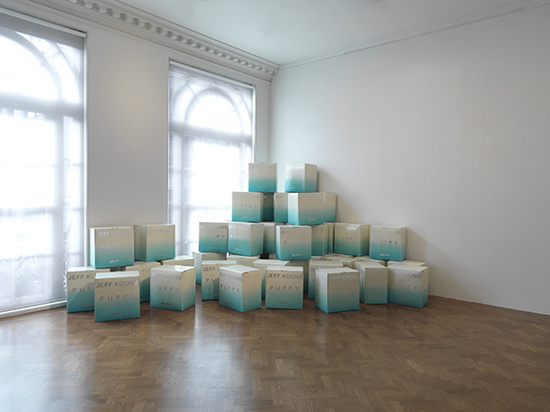 Dinu Li, an award-winning British-Chinese visual artist, showcases his exhibition The Mother of All Journeys at Amelia Johnson Contemporary (17 Sep – 31 Oct 2009) in Hong Kong. Initially commissioned by the Victoria and Albert Museum in London, the exhibition is a collection of the artist’s family snapshots which traces the journey taken by the family when they emigrated from Guangdong to Hong Kong and finally to England. Dinu Li speaks to Wendy Ma about the reasons and emotions behind this collaboration with his mother as well as his fascination with time and space. Q: You have had an interesting life. Which photographs capture your most memorable experiences? This project is about memories. The one that really captures my experiences is the picture of the first house we lived in when we emigrated from Hong Kong to UK in 1973 when I was 7 years old. As I took this photograph in 2004, there was a distance of 30 years between living there and taking the photograph. We lived there for only 1 year. We don’t know who has been sitting there since. Strange that after 33 years, they have kept the same carpet, wallpaper, and cabinet in the bedroom. Now it’s rented to students. Q: What inspired you to collaborate with your 80-year-old mother on this artwork? Is your mother an artist, too? When I was a young boy, she was always telling me her story, and I used to create imaginary images in my head. I always wanted to see the real landscape and not rely on my imagination, so that I could understand where the memories come from and make a comparison between fantasy and reality. No, my mother’s not an artist. Her job was to identify the place. I also have 6 brothers and sisters in the fields of engineering and catering. Q: Was there a gap between the reality and your imagination? She had a memory about hiding behind a tree during Japanese invasion of China. I imagined a tree in a dense forest, where she would hide. But it was just a tree on the hill, which meant that she was desperate to find anywhere to hide. In that sense it was very powerful. Q: What are your images trying to narrate other than the past? Duality. When you step into a place, there is a duality between what is personal and universal. The photograph is not just about our own experiences, but others’ as well. In the process of unearthing our personal history, there are other histories in that very space. You’re sitting here on the sofa now, so you have a history here. If I come back here tomorrow to take a photograph, I have to understand that someone else sat there and has his own history. The project is multi-layered. Past is all around us, even in the modern city of Hong Kong. Past is only one second ago, not far away. I’m deeply interested in the concept of time and space, and photography is the perfect medium that deals with this. With photography, you play with time by speeding it up, slowing it down, or freezing it still. You’re empowered with the control to manipulate time. Roland Bathes, a philosopher, called this a subconscious fear of death. Not that we think about it all the time, but the notion that there’s limited time prompt those to use films, photographs, and videos in the endeavor to understand what time and space are. Q: What feelings or revelations surfaced while exploring the sites of your mother’s past? Sometimes you go somewhere, you rediscover something you’ve not been thinking about for a long time, and all the memories reappear. When you visit a place, certain aspects trigger your memory. It can be the shape of light, the way it falls, the circular pattern it makes. Now in front of us there’s a shadow cast on the wall, if you revisit that place in 20 years, the pattern will reappear as long as the light is still standing there. Q: How is the joint creation of art different from solo efforts in your other creations? A lot of my work has some sort of links – people’s identities, their history and memories. I look at other people’s archive and their personal histories. Even though it’s personal, it’s also public. There’s a different type of duality between personal and public. Their existences are not mutually exclusive. Sometimes my mother’s history is not unique, but shared. For instance, many people have been in love or have been sick. Q: In what ways has Mother of All Journeys affected other projects of yours? Family Village and all my new projects – come from Mother of All Journeys. In 2005, a British architect had sent a Christmas card to his Sichuan friend, also an architect, who decided to build the town illustrated on the card in Chengdu. That inspired me and led me to question the authenticity of that place. In terms of features, the Chengdu town has similar tile, roofs, and chimney shape. The differences are the local materials and the fact the population in China is bigger, the houses are also taller and bigger. Moreover, the new town in Chendu brings the authenticity of culture into question. While I was there working, the security guard tried to stop me, “How do I know you’re not a British architect who came to copy our style” Apparently, he was oblivious to the origin of the building. Often we claim that something belongs to us, such as fish and chips just because they’ve been in the UK for such a long period. In fact, chips are French and fish are Dutch. So it’s interesting to find out where things come from. For the Family Village project, I scanned a particular 1950’s cartoon book and retold a narrative about a hero boy who intercepted the Japanese soldiers. My adaptation of the story is about a boy on a journey while collecting bamboo. Every time he returns home he finds his home changing. I turned a static original cartoon into a five-minute animation video. Q: What cultural shocks did you have to overcome as you emigrated from Hong Kong to Manchester? What historical events took place at that time that affected you? The idea of space – growing up in Hong Kong, we lived in small space. England offered more space. There was more space among people in the metro. The climate – the fog and snow in England. The sound – the silence in England, as opposed to the noises in Hong Kong. Since we moved in1973, compared to my parents, I was too young to be affected by historical events. In the 1960’s, people feared that the Cultural Revolution might invade Hong Kong, so those who left China for Hong Kong continued their journey to the West. Q: How do you reconcile the cultural and generational differences? It’s strange. Since my cousins didn’t leave China, there exists a massive cultural difference between them and me. Having lived in the West, I perceived things from a more objective angle. But for them in that situation, they were so close that they couldn’t see or to understand the 50’s and 60’s. You had to be further away. That’s why I became an artist. Q: I read that your father and your mother once made underwear for a factory in Hong Kong. Tell us more about it. In the 50’s, Hong Kong was like Shenzhen (a manufacturing region in the south of mainland China) now. The westerners established factories in Hong Kong, which at the time was just some island with fisherman. The exodus of Chinese people to Hong Kong meant they had to start a new life from scratch. Like others, my parents just wanted to get a job in the factories. Now history is repeating itself. Q: What artwork are you showing at the 53rd Venice Biennale? Family Village. When you step inside the gallery, you see screens suspended in the middle of the room like a moon, inside which there is a story of a boy watching his home changing all the time as he is picking bamboos. Inside the video, children are chanting the Chinese translation of a western song from the 1970’s film Willy Wonka and the Chocolate Factory. Q: During the 4 years of making Mother of All Journey, has anything changed? Yes. You start off taking many photographs, and then you keep editing it to make it smaller until you get the core. The most important bit is the real meat of the project. Similar to making a soup, you have to patient and allow time to condense it to the best bit. I can’t just take a photograph and use it immediately. The period of four years allowed me to develop a distance from my photographs and therefore choose wisely. In the last year, I finally reduced the bunch from 300 to 35-40 based on the content. Q: What was behind your inspiration? People take things for granted so much that they feel they don’t need to reflect. My mother’s very old, so I must reflect. Mother of All Journeys has inspired others to start similar projects. It’s a personal project that touches a large audience. Q: What’s your current project? I’m doing an artist residency in Shenzhen. I like that it’s on the border of China and Hong Kong. Sometimes my projects are accidental, and other times, to be inspired, I need to be physically in that particular place. Sun Yuan and Peng Yu, born in the early 1970s and both alumni of the prominent Beijing Central Academy of Art, have a long-established reputation in Asia for their controversial collaborative installations featuring animals, human tissue and baby cadaver specimens. In the west they made a big splash in 2008 at the record crowd-drawing Saatchi exhibition of new Chinese art, The Revolution Continues with a satirical work called Old People’s Home (click for video). Both popular and critically-acclaimed, this life-sized 2007 work featured sculptures of decrepit old people “looking suspiciously like world leaders… now long impotent”‘ rolling slowly in wheelchairs around the gallery and occasionally crashing into one another. Taking a surprising new direction, their exhibition Hong Kong Intervention (Aug 22 – Oct 10) at Osage Gallery delves into the working environments of Filipino domestic workers in Hong Kong. Each of the 100 Filipino participants took a photograph of a toy grenade placed in his or her employer’s home. Sun Yuan and Peng Yu talk with Wendy Ma about whether or not this experiment in spatial intrusion by Filipino maids creates tensions. Toy grenade placed in the center of a dining room and the back of the Filipino maid. Photography by Sun Yuan and Peng Yu. Image Courtesy to Erin Wooters. AR: What inspired you to make photos with Filipino domestic staff? Two years ago at a square in Central I observed the mass congregation of Filipino girls. I thought it was a very interesting situation since each one is connected to a family in Hong Kong. I started chatting with them and obtained their agreement to volunteer to do the photo shoots. Through them I could intervene in an relationship. AR: Why do the photographs include the image of a toy grenade? To intervene, I wanted to use a toy specifically bought in Hong Kong. It was up to them to place it anywhere inside their owner’s house, e.g. inside a garden, on the bed, blending it with the environment. Then they take a photograph of the scene. The toy is a legal product. When your kid plays with a toy grenade, you might find it cute, not dangerous. It was a chance for the participants to exercise their creativity. We wanted to use a very simple object to show how it can open up possibilities. AR: Is it just a game or does it carry other implications? It is a game because there are no real consequences. An example of something that is not a game would be the recent incident when a reporter threw a shoe at George Bush. However, it would’ve been a game had he said, “I’m going to throw it at you, first at your head then at your chest.” By not carrying it out, it would have remained just a concept. If something happens in reality, it changes the environment. But right now our work is only a photograph. The proposition of the game is neutral. It doesn’t carry implications of danger. Last night someone told me that they treat their Filipino maids like guests. Hidden toy grenade on the book shelve and the male domestic worker. Photography by Sun Yuan and Peng Yu. Image Courtesy to Erin Wooters. AR: Why is the photograph of the back of the worker juxtaposed next to the surroundings? Actually, neither the person nor the environment is significant. They are entities with no individual characteristics. Instead of specifying a particular being, I just want to describe a phenomenon. AR: What have you found out about their lives and about contemporary Hong Kong society? One third of the Filipino population live outside their country. They are a special group in Hong Kong. During the week they enter into the homes of different families. On Sundays, they bond and return to their own world. When they work, they disappear into the families of Hong Kong. They play different roles in their working and living environment. They use their culture to communicate. As for us, we work outside the family and we bond when we return to our home. For them, they enter our families to work. It’s the reverse. Bedroom and Filipino maid. Photography by Sun Yuan and Peng Yu. Image Courtesy to Erin Wooters. AR: Why is the exhibition called Hong Kong Intervention? Intervention in Chinese can be small (eating a crab) or large-scale (invading a country). It can be magnified in the imagination of readers. You can imagine the explosive possibilities of the toy grenade, despite the fact that in reality it cannot explode. How the viewer perceives ‘intervention’ is beyond my control. Intervention can be a strategy to communicate ideas. Ours is the study of a social phenomenon. It does not necessarily mean invasion or changing a situation as it does in the English expression “tossing a grenade”. Words acquire different meanings in different situations. They cannot be precise. Words cannot express what you actually feel. So art is not expressed through words or titles but through a different means to pull you closer to the underlying meaning. AR: Are you concerned that the proprietor might feel violated if he saw the photograph of his home on display? We had no intention to expose individuals. Like I said, the photos of the maids and the homes are not meant to be specifically meaningful; they only a representation and a portrayal of the mass. Bedroom of a Hong Kong owner and the Filipino maid. Photography by Sun Yuan and Peng Yu. Image Courtesy to Erin Wooters. AR: What is the role/identity of Filipinos in your work? Creators, participants, or assistants? I consider all the participants as collaborators: not just Filipinos, but also the audience involved in the discussions. They are common authors of the work. As part of the contract, we don’t have to give credit to them by listing their names as they transferred the copyright to us. Editor’s note: This post is interesting to contrast with a recent exhibition at Para/Site in Hong Kong in which Filipino domestic helpers were invited to receive manicures given by the Australian artist collective Baba International. Whereas Baba International sought to nurture and engage with their subject physically, the “‘Intervention”‘ exhibition carries intriguing tones of depersonalisation and violence. Baba was keen to explain the intentions behind their work whereas Sun Yuan and Peng Yu step away and allow the viewer to explore and fully shoulder the responsibility for interpretation. From 20 June to 2 August 2009, renowned nonprofit Para/Site Art Space in Hong Kong makes its space available to the Chalk Horse Art Center, an artist run initiative from Australia for a rare display of Australian contemporary art. There are less than a handful of commercial galleries (Gaffer and Cat Street being two of the principal ones) which show Australian art in Hong Kong and in the non-commercial arena Australian art is even more rare. So why Hong Kong? …and why now? Artist Oliver Watts explains: “In Australia there is a lot of interest in Asia right now, a lot of government interest in funding these kind of cultural exchanges. After all our prime minister speaks Mandarin. We approached Para/Site about this project earlier in the year because it has an outstanding reputation in Australia”. Their initiative was well-timed because Para/Site has become a fertile ground for such a project. At the beginning of this year Alvaro Rodriguez Fominaya took the helm as Executive Director and Curator at Para/Site and he has made it his mission to encourage collaboration and exchange between artists within the Asia Pacific region. So far this year Fominaya has curated shows by Japanese performance artist Tatsumi Orimoto and Thai installation artist Surasi Kusolwong. This time he is stepping back as curator to allow Australian curator Dougal Phillips to present his exhibtion called The Horn of Plenty: Excess and Reversibility, a showcase of video, performance, installation and painting by young Australian artists. The double themes of ‘excess’ and ‘reversibility’ refer to the recent juddering reversal of the economy from excess which is represented by the magical horn of plenty. In mythology this horn, which Zeus provided for the goat Amalthea, endlessly overflowed with fruit, flowers and grain. The title of the show is topical but not an adroit fit with the artworks; no matter though because there is some powerful art on display. Look out for Christian Bumbarra Thompson’s two compelling video artworks. Thompson is the most senior artist in the show and his The Sixth Mile (2007) was shown at the inaugural National Indigenous Arts Triennale: Culture Warriors which “explores cultural hybridity and recalls nostalgically the importance his father placed on personal grooming”. In the 34 minute Desert Slippers made in 2007 we see Thompson and his father engaging in repetitive ritualistic movements of armpit touching. Sweat-swapping becomes a disconcertingly intimate greeting ceremony. A graduate of RMIT in 2004, Bumbarra Thompson (b.1978) is gaining recognition for his multiple talents as photographer, installation artist, curator and writer. His works have been exhibited extensively across Asia Europe and the South Pacific. Kate Mitchell (b. 1980) too is interested in the the human body as a medium and creates powerful performance art from by turning herself into a human sundial. In the video which records her arresting 8 hour endurance performance in its entirety, Mitchell stands in the blistering sun from 9 am to 5 pm so that her shadow can mark the time of a perfect working day. Mitchell could probably have done with some serious pampering after her toil and if you feel that you could too, then come to Para/Site space between 24 and 28 June 2009.
although a nail salon tended by boys, who admit they are still honing their skills in nail care seems like an entertaining spectacle, the project has intriguing socio-political undertones. The salon is specifically aimed at providing pampering for Filipino maids on their day off after the collective became aware that domestic workers were congregating in an underpass in the absence of public spaces and leisure areas accessible to their socio-economic means.